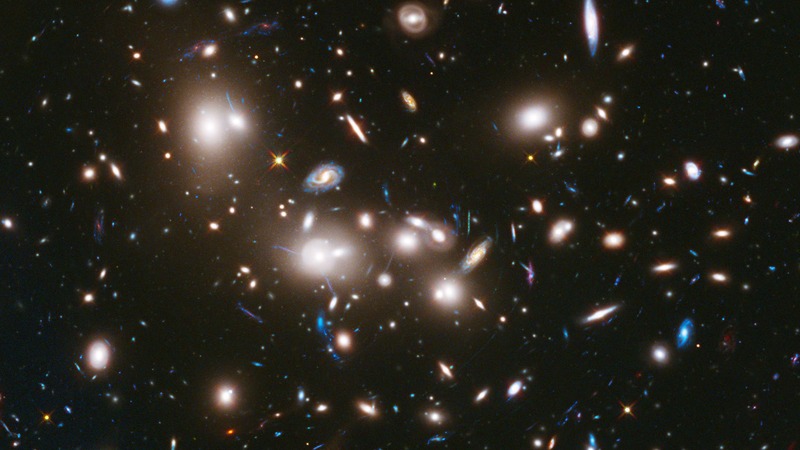 “Cosmic Variance” –Are There Fewer Faint, Distant Galaxies in the Universe? There may be far fewer galaxies further out in the universe then might be expected, according to a new study. Over the years, the Hubble Space Telescope has allowed astronomers to look deep into the universe. The long view stirred theories of untold thousands of distant, faint galaxies. New research offers a theory that reduces the estimated number of the most distant galaxies by 10 to 100 times. "Our work suggests that there are far fewer faint galaxies than we once previously thought," said Brian O'Shea, Michigan State University associate professor of physics and astronomy. "Earlier estimates placed the number of faint galaxies in the early universe to be hundreds or thousands of times larger than the few bright galaxies that we can actually see with the Hubble Space Telescope. We now think that number could be closer to ten times larger. O'Shea and his team used the National Science Foundation's Blue Waters supercomputer to run simulations to examine the formation of galaxies in the early universe. The team simulated thousands of galaxies at a time, including the galaxies' interactions through gravity or radiation. The simulated galaxies were consistent with observed distant galaxies at the bright end of the distribution – in other words, those that have been discovered and confirmed. The simulations didn't, however, reveal an exponentially growing number of faint galaxies, as has been previously predicted. The number of those at the lower end of the brightness distribution was flat rather than increasing sharply, O'Shea added. These simulations will be tested further when the much-anticipated James Webb Space Telescope comes online in late 2018. The improved technology will afford astronomers even more-detailed views of space than the amazing images that the Hubble has produced in recent years. The Hubble Space Telescope can see the tip of the iceberg of the most-distant galaxies, said Michael Norman, co-author of the paper and director of the San Diego Supercomputer Center at the University of California, San Diego. While the James Webb telescope will improve views of distant galaxies, the telescope has a relatively small field of view. As a result, the observations must take into account cosmic variance – the statistical variation in the number of galaxies from place to place. That's what makes these simulations pertinent even as improved technology becomes available, O'Shea said. "A deeper understanding based on theory may be necessary to correctly interpret what's being seen, such as high redshift survey results," he said. NASA: "Rejuvenated Planets Can Survive a Stars' Red-Giant Death Cycle"